The public has not heard much lately from Markus "Notch" Persson, the famed creator of Minecraft. He did some interviews after the sale of Mojang and the purchase of his $70 million Beverly Hills mega-mansion, but since then he has been mostly quiet... except on Twitter. On Twitter he has been the epicenter of multiple controversies, resulting not only in the ire of the loud cadre of people who disagree with him, but multiple editorials in the gaming press attacking him for his opinions. For every opinion he tweets it seems a new editorial is born; outrage neatly packaged into ammunition for the great internet culture wars. But in all of those editorials you rarely see any clarification or even an attempt at talking to the man himself. That is why I knew I had to interview him. If virtual page upon page is to be written every time he posts a 140-character bombshell, then I wanted a chance to talk to the real Markus Persson behind the controversial tweets, if only for context. Convincing him to give me an interview was not easy. He is, as one would expect of someone whose opinions generate a legion of editorials, suspicious and cautious around journalists. Once we began talking, however, I found him to be friendly, candid, even charming. He was quick to laugh and listened earnestly. We spoke on Skype for nearly 90 minutes, and by the time it was over it felt less like an interview with an opinionated billionaire, and more like a fun, captivating conversation between geeks. This interview reminded me of the value of good conversation, which social media, for all its uses, can never replicate. 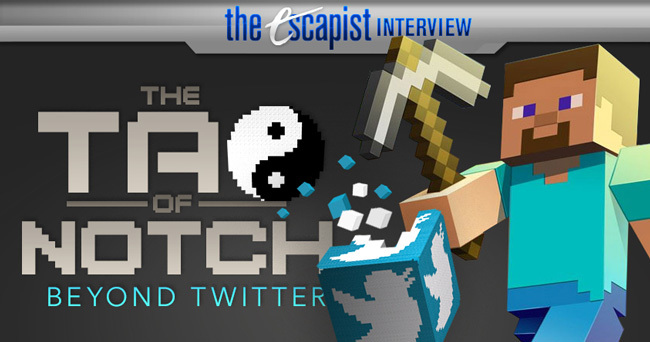 The Escapist: Do you miss Minecraft? TE: So you still play it? MP: Very rarely, very rarely. Every once in a while it pops up on some kind of list of games somewhere and I click it just to see what it's like now. TE: Since the sale you've spoken candidly about the experiences of becoming suddenly wealthy. Ten years ago you were probably middle class and now you are famously rich. MP: After my parents divorced it was two kids with a single mom working as a nurse. A few months there sometimes, or I remember at least one month, she was kind of uncertain if we could afford food for the entire month. She let me know after the fact, but she would kind of just hide it and like cook crappy Finnish food and it became a family thing instead of it being like, "oh we're so poor." "I tend to kind of deconstruct and overanalyze a lot of things. But I try not to deconstruct it too much because if I feel like I'm having a good experience then I probably am." TE: You've talked on Twitter about feeling isolated and you mentioned that it is difficult to tell who is your friend and who is there for the money. You've talked about how you like Vegas because you know everyone is there for your money. MP: This was like a year ago or something? MP: Since then I've basically come completely out of it. Because I also realized that I'm really an introvert. So I think I kind of had this problem before, always, for my entire life. I didn't necessarily want to have a lot of friends. And then once you sell your company and have a lot of money there's not much else to do than continue learning or meet friends and exploring the real world, which is really fun, but it has been kind of a jarring change. I got to play it off, all of it, as just being a weird, eccentric Swedish guy, so it was easier to stop being social. TE: It seems that it created an image online where people think you are this lonely, depressed rich guy with nothing to do. MP: Well yeah, that's the cultural idea of who I am, that I've become that. MP: I mean, I spend a lot of time alone, but it's not as if I'm lonely, because that's how I feel the most productive and happy. Generally if I've been alone programming for a couple of months then yeah I'm going to want to go out and see friends. So I kind of go back and forth, spend some time just programming and learning, you know, playing around with WebGL. And then I spend like a month doing a lot of social stuff like partying. I love partying. And a lot of dinners. I'm trying to learn how to appreciate red wine, which is impossible. I like red wine but I never remember any of it, like names of the old French chateaus. TE: Can you tell the difference between an expensive red wine and a cheaper one? MP: I will pretend to! The way you seem like you know what you're doing is if you just do things confidently you can do absolutely anything. You can drop ice cubes in your coffee if you want, as long as you do it like a hundred times. So I don't know how many people that drink wine are actually just doing that or if they can actually appreciate nuances. MP: (Laughs). I tend to kind of deconstruct and overanalyze a lot of things. But I try not to deconstruct it too much because if I feel like I'm having a good experience then I probably am having a good experience. So I'm starting to get into rye whiskeys because I never had any whiskey I've liked. I say all kinds of things like, "oh it's a raspy aftertaste" or whatever, but I'm not so sure I'm maybe actually sensing that or if I'm saying it because I want to enjoy it.